Multi Top Wooden Spinning Top is a clever wooden changeable spinning top that can change its colours by using four patterned plastic discs. This little red wooden top has four removable flexi plastic discs which push onto the tops spindle so you can swap colours and change the patterns the top makes as it spins. 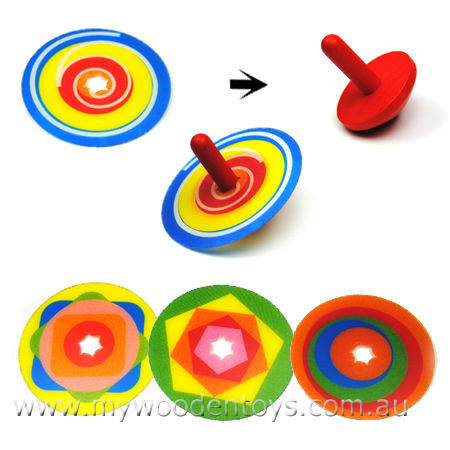 A well balanced spinning top which works with or without the plastic discs this is a great addition to a classic toy. It is also possible to make and decorate your own discs with cardboard using the plastic ones as a template. Size: Top is 4.5cm high x 3.5cm wide. Changing discs are 6cm diameter. Material: Wooden Top, Flexible plastic Disc. We like this because: "Simple clever idea lovely patterns."